Liesel manages the implementation of the NCD Roadmap and Business Plan in close co-ordination with the UN Environment Programme Finance Initiative. Her role includes NCD Programme Manager to co-ordinate the four working groups that aim to help financial institutions meet commitments to integrate natural capital considerations into financial products and services, accounting and reporting. She also project manages the first working group, to build an understanding of the risks and opportunities around the impacts and dependencies of financial institutions on natural capital. Simone manages the German Government’s Emerging Markets Dialogue on Green Finance, under which she and her team work with financial institutions from G20 Emerging Markets and Europe to integrate environmental costs into financial decision making. As an expert on green finance at the German International Cooperation (GIZ), she furthermore advises projects in emerging economies worldwide on renewable energy and energy efficiency financing, incorporation of natural capital considerations in financial decision making, as well as innovative approaches for green economic development. There is growing evidence that mismanaged water resources can not only harm the environment but also threaten corporates’ and investors’ bottom line. Despite this, there is still no globally leading method for quantifying these “water-related risks”. 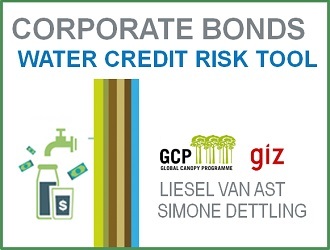 The Corporate Bonds Water Credit Risk Tool aims to fill this gap. China Water Risk sat down with Liesel Van Ast and Simone Dettling, who helped design and develop the tool, to learn more about the tool’s applications and benefits. China Water Risk (CWR): In September 2015, you released the first version of the Corporate Bonds Water Credit Risk Tool. What is the purpose of the tool? Liesel Van Ast (LVA) & Simone Dettling (SD): Water-intensive companies may experience higher than anticipated costs or more volatile production at operations in areas facing high levels of water stress – where the ratio of total domestic, industrial and agricultural water withdrawals in a catchment in a given year are high relative to the total available water. The tool addresses the need for investors to more systematically integrate water resource constraints in their decision making process and translate exposure to water-risk into a quantified financial risk. It also enables banks to systematically integrate water stress into standard financial analysis of companies that issue corporate bonds. The tool can also be used to inform engagement programmes, provide enhanced due diligence and support portfolio reviews. The tool was developed in a project by Deutsche Gesellschaft für Internationale Zusammenarbeit (GIZ), the German Association for Environmental Management and Sustainability in Financial Institutions (VfU) and the Natural Capital Declaration (NCD) – a joint initiative between the UN Environment Programme Finance Initiative and the Global Canopy Programme (GCP). CWR: So what exactly is the tool? Who can access it, and do they have to pay? LVA & SD: Investors can use the free of charge Excel-tool to conduct their own assessments to benchmark companies on exposure to water stress and integrate sensitivity tests on their credit ratios into existing bond credit risk assessment tools. The tool is available in English and Mandarin. Conducts scenario analysis of the impact of three potential water stress scenarios on 24 companies from the power, mining and beverages sector. The tool has the functionality for users to add more companies and sectors, if they have the corresponding corporate financial, operational and water use data. CWR: You mentioned the tool uses a shadow water price as a proxy for exposure to water stress. How does it do this? LVA & SD: The tool calculates shadow water price as a proxy for exposure to water stress. The higher the level of physical water stress, as indicated by World Resources Institute data, the higher the shadow price. Shadow water prices can be calculated for each site at which a company operates. This is done by inserting the longitude and latitude of each location. The shadow price is then weighted by the level of production at each location, based on sector-specific indicators such as reserves, installed capacity, or hectolitres for beverages firms. The tool therefore calculates a company-specific shadow price to reflect the overall level of water use at different levels of water stress across global operations. Each company’s specific shadow water price can then be applied to its total water use to estimate total shadow water costs, and model sensitivity to the impact of increased water operating expenditure to secure water supplies. Shadow water costs can be internalised through pathways such as expenditure on infrastructure including desalination, changes in water rights, or higher water tariffs. CWR: How do you estimate this shadow water price? LVA & SD: The shadow price is based on the total economic value (TEV) framework, which attempts to capture both the benefits that water provides with the private benefits enjoyed by water consumers. TEV tries to capture that value of water for alternative uses, focusing on agriculture, domestic supply, human health and environmental services (supporting biodiversity). The function includes two independent variables – water stress and population. More densely populated areas can experience greater competition for water resources and a greater supply/demand gap. The model applies a formula to calculate shadow prices at different locations around the world, in the years 2010, 2020, 2030 and 2040, to allow scenario modelling for potential changes in water stress under predicted climate change impacts over time. The tool enables users to calculate the shadow price of water at all land-based locations for these years. CWR: Once you have the shadow water price, how do you integrate it into companies’ financial models? LVA & SD: The shadow water price of each company are included as an additional operating expense (OPEX) line in a standard credit analyst’s company model. What is novel about this model is the inclusion of location-specific information about the firms’ operations and water use. As a consequence of this additional OPEX, the different credit ratios are affected, such as net debt/earnings before interest, taxes, depreciation and amortisation (EBITDA). A portfolio-view enables users to easily benchmark companies on exposure to water stress so that further due diligence or engagement can focus on those most at risk. Users may adjust assumptions about the level of costs stemming from growing water scarcity and competition, if they have access to additional information on water management costs, for example. CWR: What sectors can use the tool? What data does one need to use it? CWR: You ran 24 case studies in 3 sectors: mining, power and beverages. What key points came out from these? LVA & SD: The mining sector had the greatest overall exposure, then power and lastly beverages. Dependence on water use in areas of water stress, and potential exposure to related financial risks across organisations, varies significantly. Investors would benefit from understanding how companies are positioned. The amount of water used and security of supplies are critical to analyse exposure. Modelled impacts using the Corporate Bonds Water Credit Risk Tool show that Rio Tinto, BHP Billiton and Glencore could be most impacted by water stress, of the eight mining firms analysed, because they all use a significant amount of water and are exposed to relatively high weighted average shadow water prices. CWR: What are the next steps? LVA & SD: The tool was released in September 2015. Later in 2016 the NCD will follow up with investors who have downloaded the tool so to develop case studies on its application and outcomes. Building on the development of the tool, GIZ and the NCD are now developing modelling to stress test corporate lending portfolios for tail risks from drought, working with banks in China, India, Brazil, Mexico and the United States. An Expert Council including: Cate Lamb of the Carbon Disclosure Project, Allan Provins of Eftec, Dr. Martina Flörke of Center for Environmental Systems Research, University of Kassel, Archie Beeching of Principles for Responsible Investment, Mike Wilkins of Standard and Poor’s Ratings Services, Ivo Mulder of United Nations Environment Programme, Professor Dolf de Groot of Wageningen University, Paul Reig of theWorld Resources Institute and Oliver Männicke of WWF Australia.